Top row L-R: Florian Herrault (HRL), Ignacio Ramos (HRL), Mauricio Pinto (University of Colorado Boulder), Chip Moyer (HRL), Hasan Sharifi (HRL), Dan Denninghoff (HRL), Andrea Corrion (HRL), Paul Watson (AFRL), Donald Lie (Texas Tech University). Bottom row L-R: Matthew King (HRL), David Chow (HRL), Tony Quach (AFRL), Bryan Sanbongi (AFRL), Aji Mattamana (AFRL), Jill Mayeda (Texas Tech University), Shawn Burnham (HRL). © 2018 HRL Laboratories. 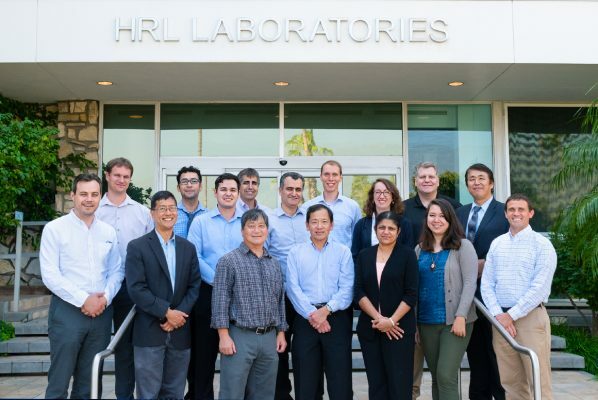 HRL Laboratories, LLC, has received an awardfrom the Defense Advanced Research Projects Agency (DARPA) to significantly advance the technology and manufacturing readiness levels of its leading-edge millimeter-wave (mm-wave) T3 gallium nitride (GaN) electronics. Integrated circuits made by layering GaN onto silicon carbide substrate wafers offer the best combination of efficiency, output power, and survivability among radio frequency (RF) and mm-wave semiconductor technologies. This makes these GaN devices and monolithic microwave integrated circuits (MMICs) key components for next-generation radars, electronic warfare systems, and communications systems. A GaN transistor wafer under an inspection probe. © 2016 HRL Laboratories. As part of this program, engineersfrom HRL’s Sensors and Electronics Laboratory conducted a workshop on October 29, 2018 to work with circuit designers from outside academic institutions and government laboratories on HRL’s T3 GaN MMIC technology process design kit.